There’s no question one of the best places in the world to fish this time of year is the Florida Keys. There are so many options to fish for in key largo from Mahi to Swordfish to Tarpon to Snapper, we have it all. 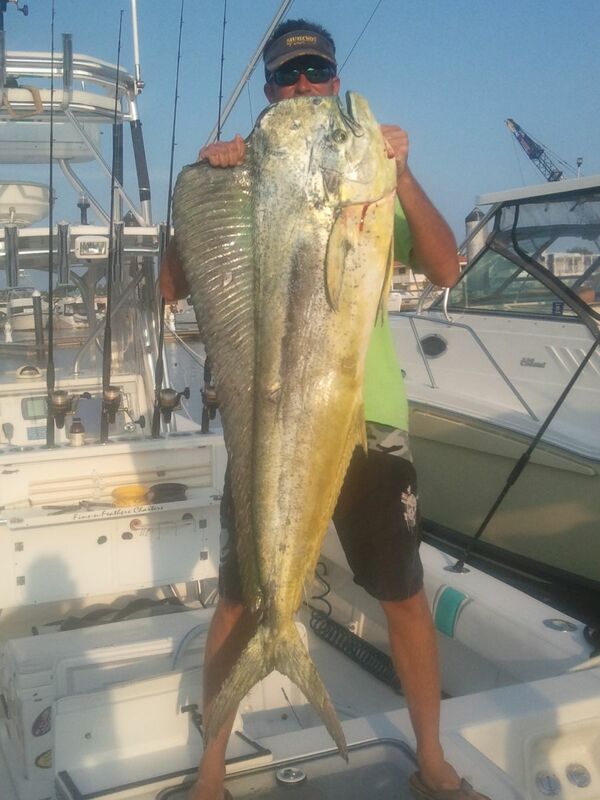 The mont of June has seen plenty of action with small schoolie mahi in the 3 to 6 pound range. every day has also seen an encounter with at least one fish exceeding the 20 lb. range. The most successful method of fishing key largo in the summer is trolling artificial baits with a couple of live baits rigged ready to pitch when we spot a free swimming mahi under working birds. An exciting way to fish off key largo, sight fishing for mahi offers an angler a hands on approach to catching these colorful mahi. Still seeing some tuna action with these fish averaging 5 to 8 lbs. Using light tackle these tunas really put up a good battle. There have been reports of Swordfish being caught off key largo from anglers venturing offshore to the shelf where the depths dropp from 1000ft to 2000ft within a mile. Most of these swordfish are averaging 100 lbs. with a few over 300lbs.